From the outside looking in Australia and The United States look very similar. We speak, to all intents and purposes, the same language, we watch the same television shows, enjoy the same music, etc. But anyone who has ever swapped countries and lived on the other side knows that deep down the culture and outlook of both countries are deeply and substantially different. So it is with Market Research and Customer Feedback. In explaining what we (Genroe) do I’ve been saying for a while now that we are not a market research company, we are a customer feedback specialist. To me the difference is as clear as day, but I sometimes wonder if everyone can see the difference so starkly: maybe to other people it looks like Australia and the USA, basically the same. It’s true that both disciplines listen to customers, run surveys, compile and analyse data, present charts to senior management so maybe they are the same: but they aren’t. A customer feedback program should be viewed not as ‘market research’ but as an operation management tool. The role of the customer feedback program is to maximize the value of the existing business platform and customers. In manufacturing or industrial processing terms, the customer feedback is process used to maximize throughput or production; make the very most of the equipment that you already have. Customer feedback is an operational management tool that helps to continuously adjust business operations. Listening to customers, making a tweak here, or an update there, today, tomorrow, and everyday. This is the is day to day rhythm of the customer feedback process. Improving things 1% at a time is the goal, not upending the system in the hopes of a 100% improvement all at once. Customer Feedback is inherently lower risk than market research because it is making many small improvements to the business over time, not seeking to make large one-off changes. Running a service recovery process and reaching out to one unhappy customer to save them is a small low risk intervention. Value comes from doing many small interventions. The same is true of making a change to an aspect of a product or service in order to incrementally improve it. These are low risk changes for the organisation. When implemented correctly it is a closed loop process. Ask a customer, listen to their response, identify a good change, make the change, see how it affects the customer; rinse and repeat. If your program is not closed loop you should be looking at the changes required to make it so. The process is a continuous test and learn loop. In just the same way as you test and re-test a marketing campaign to continuously improve the response rate. Using the feedback you receive you continually identify potential improvements to the customer experience. When you make the change you should test to measure the improvement that it provides. This is much easier with Transactional customer feedback processes. Continuous: Start, no middle, no end. As indicated above the customer feedback process is continuous. It can be annual or quarterly or even monthly. In it’s most continuous form it is transactional customer feedback where you collect customer perceptions after each and every transaction. Importantly customer feedback is not a project it is a business process. It doesn’t not have a start, middle and end; it only has a start. As the name suggests customer feedback is all about collecting input from people and organisations that are already doing business with your organisation. It, generally, does not seek input from customers of other organisations, non-customers, tire-kickers, etc. All of this is not to say that customers feedback is not able to deliver break through ideas. It just means that discontinuous innovation is the key goal of customer feedback. Market research is more about building the refinery or manufacturing facility than improving it in an incremental manner. This about gathering the input to create new products and services. Market research is strategic in nature and seeks to answer larger questions: what products do our customers want, what market opportunities exist, how should we design our overall service offering. Typically, research is project based and targeted with answering a specific set of objectives. The objectives are often areas such as : product preferences, trends in buying behavior price elasticity. Having identified the areas to address the process progresses through a series of steps that end with a report being presented. This is the finish of the market research project. Following on from the project another may be instigated. It may have a similar overall process and will often pick up from the conclusions of the prior project but it is a new project. The overriding goal of market research is to look for new business. That may be new products, new markets, new segments of existing markets or new services but it is always “new something”. 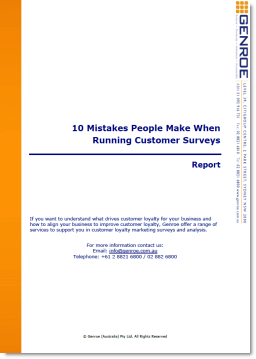 None of this is to say that Customer Feedback is better, or worse, than Market Research, just that it is different. It has different goals, different processes, touches different parts of the organisation and has a different rhythm. In order to drive real value you need to identify those differences because if you try to use market research approaches to delver customer feedback outcomes you are sure to fail. The same is of course true of the reverse. Said right customer feedback and market research are different but the customer’s feedback is too useful for market research purpose to know what your customers want and to reach the targeted customers.